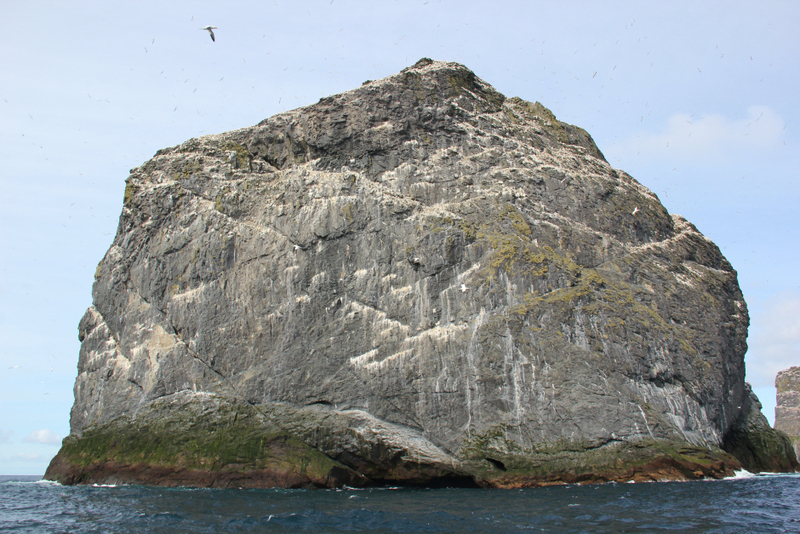 A 'Marilyn' is a British hill of any height with a drop of at least 150m on all sides. At the time of writing this report there are 1556 known Marilyns. A few weeks ago, John and I agreed to both ascend our 1000th Marilyn together and to choose somewhere special. 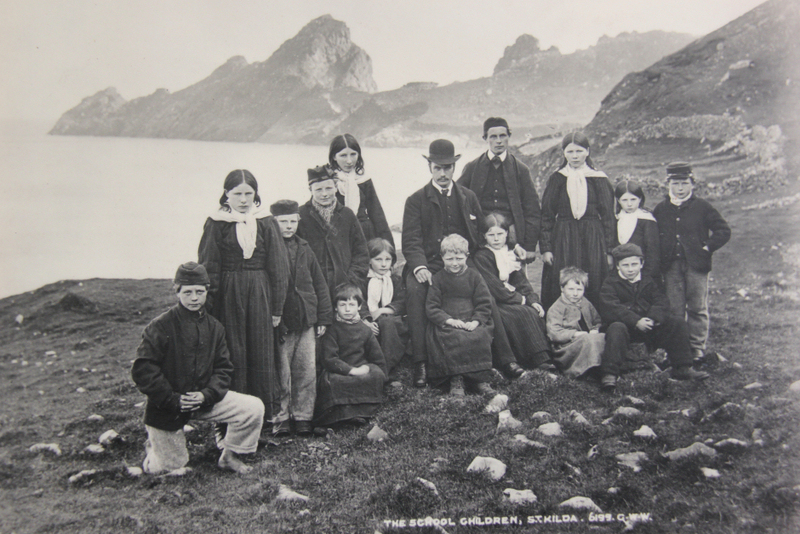 That somewhere special was, St. Kilda. 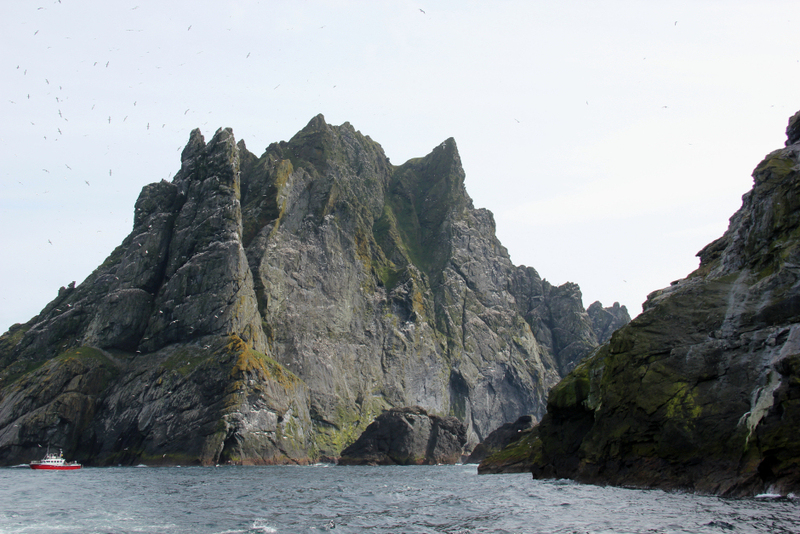 The archipelago of St. Kilda is the remotest part of the British Isles, lying 41 miles West of Benbecula in the Outer Hebrides. 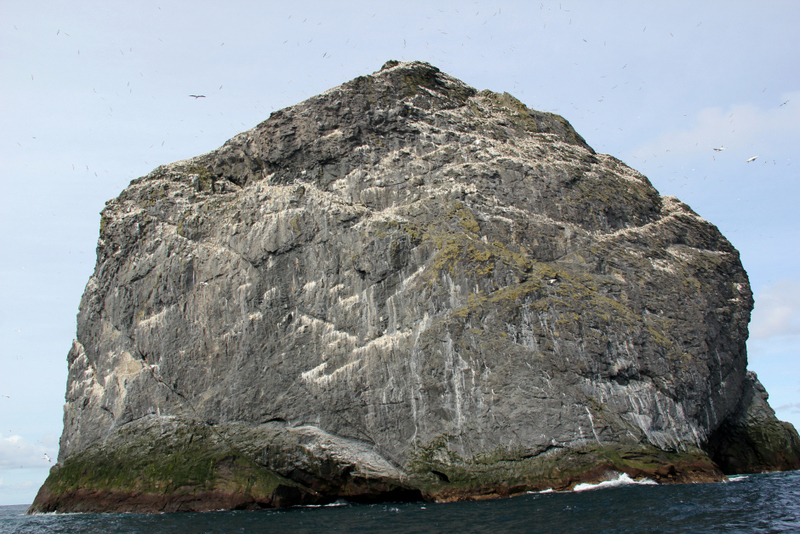 The islands and sea stacs are the most important seabird breeding station in North-West Europe. 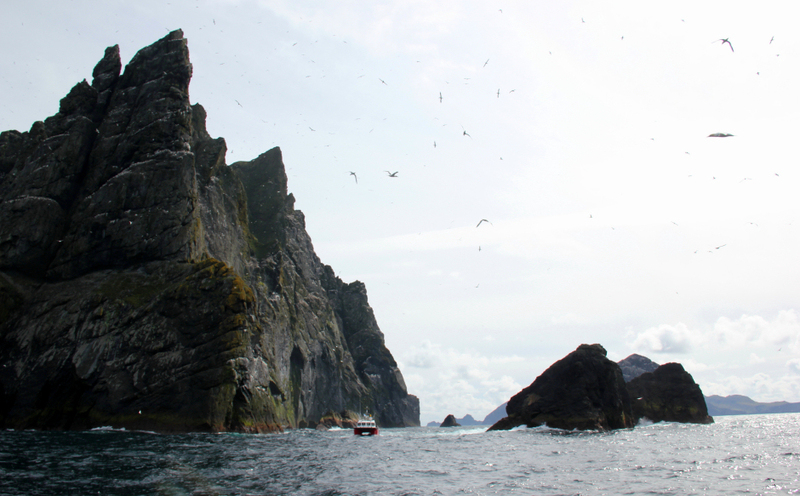 The island of Hirta has the highest sea cliffs in the United Kingdom. 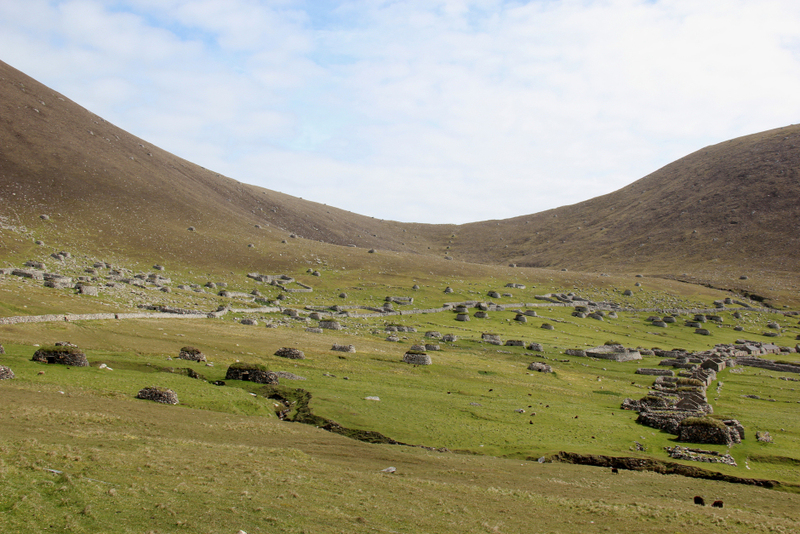 St. Kilda may have been permanently inhabited for up to two millennia, the population probably never exceeding 180. 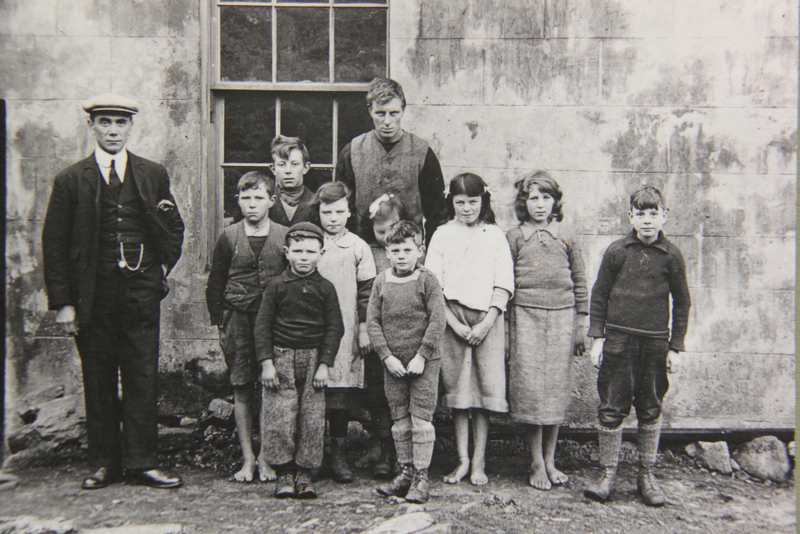 Illnesses brought by increased external contact resulted in the entire remaining population being evacuated in 1930. 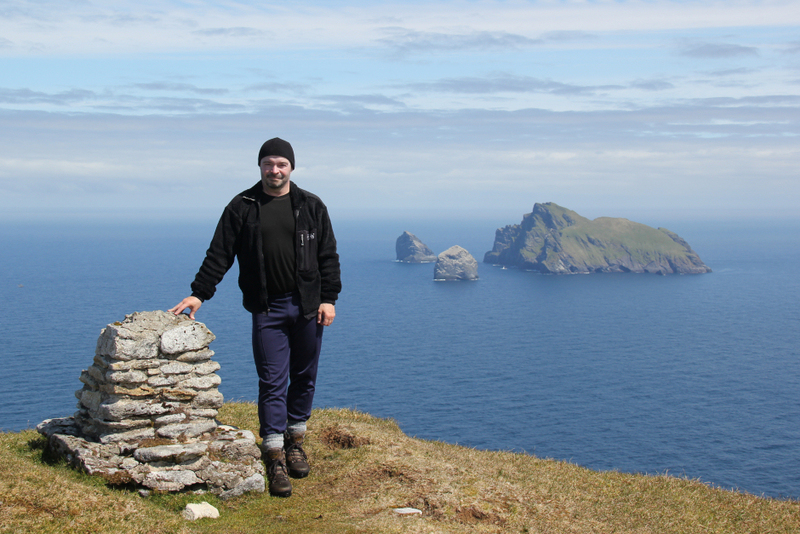 Now residing on St. Kilda are military personnel, conservation workers, volunteers and scientists. 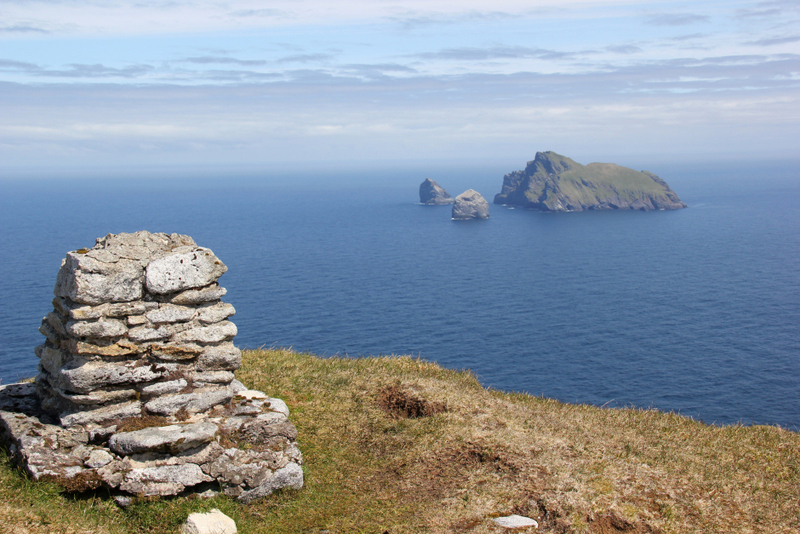 The entire archipelago is currently owned by the National Trust for Scotland. 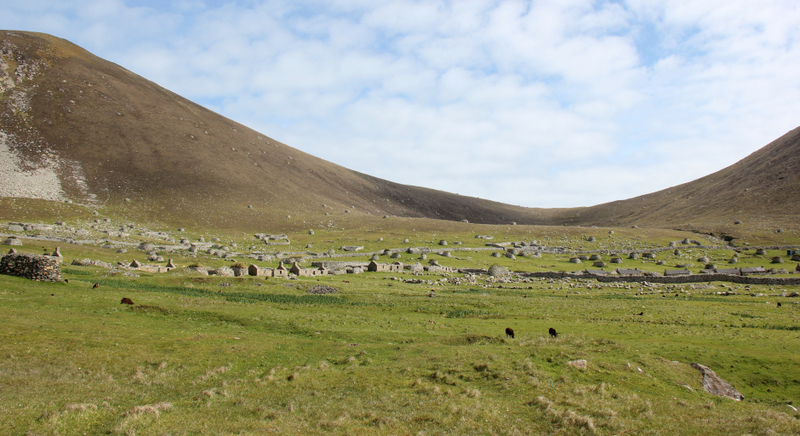 It is one of only a few sites in the world to hold dual World Heritage status; for natural and cultural qualities. To see lots more information click here. 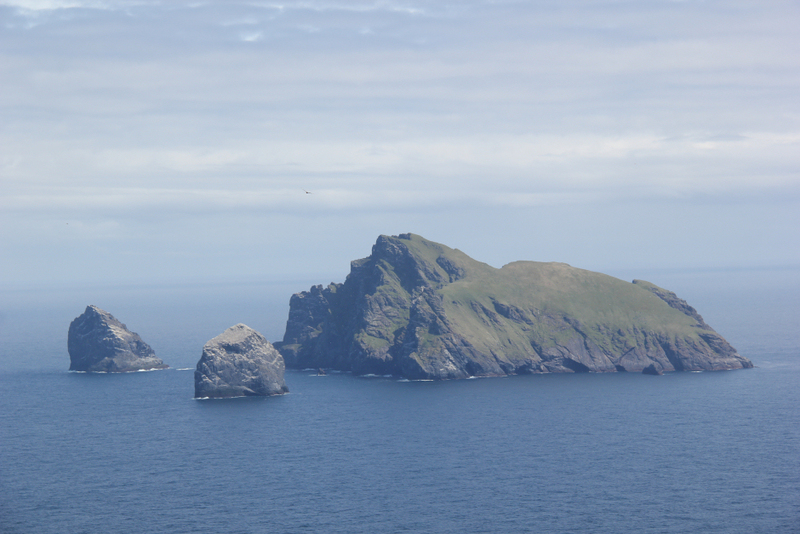 The archipelago of St. Kilda has six Marilyns located on four islands (Hirta, Dun, Soay and Boreray) and two sea stacs (Stac Lee and Stac an Armin). 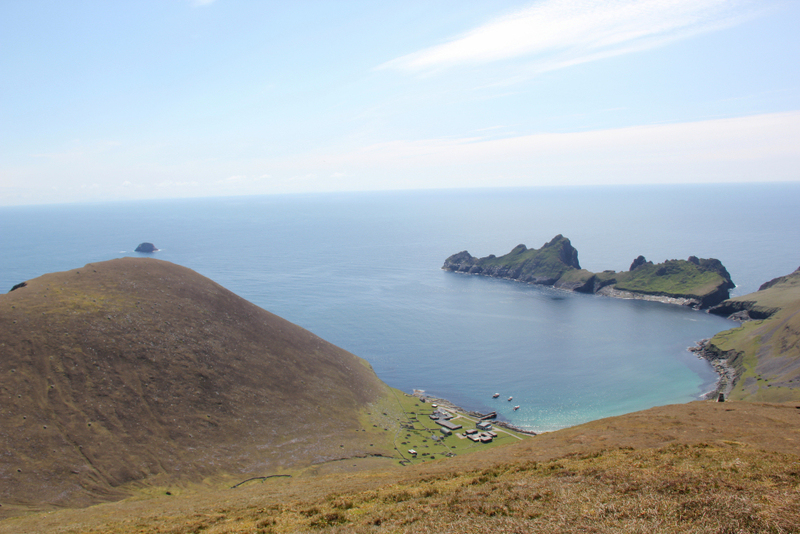 For our 1000th Marilyn, John and I would be ascending the easiest of the six, Conachair on Hirta. 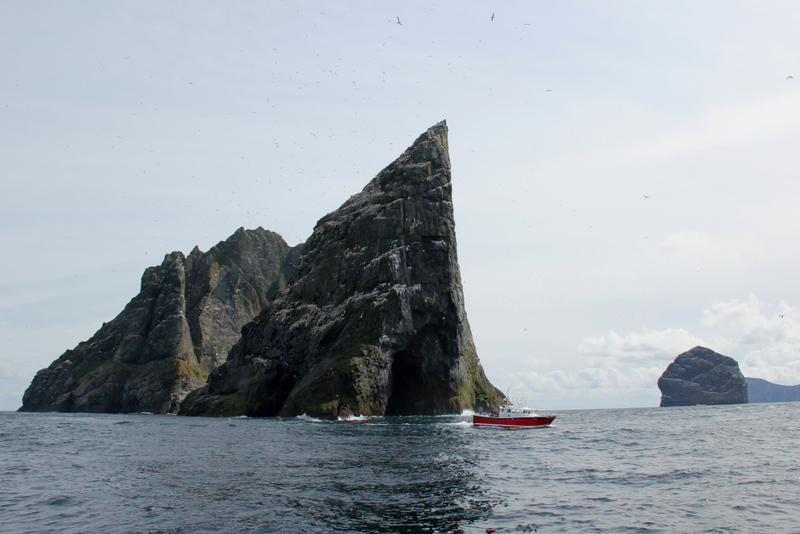 Getting to and from St. Kilda would involve over ten hours of travelling both there and back. From home, I drove to Ullapool picking up John en-route. 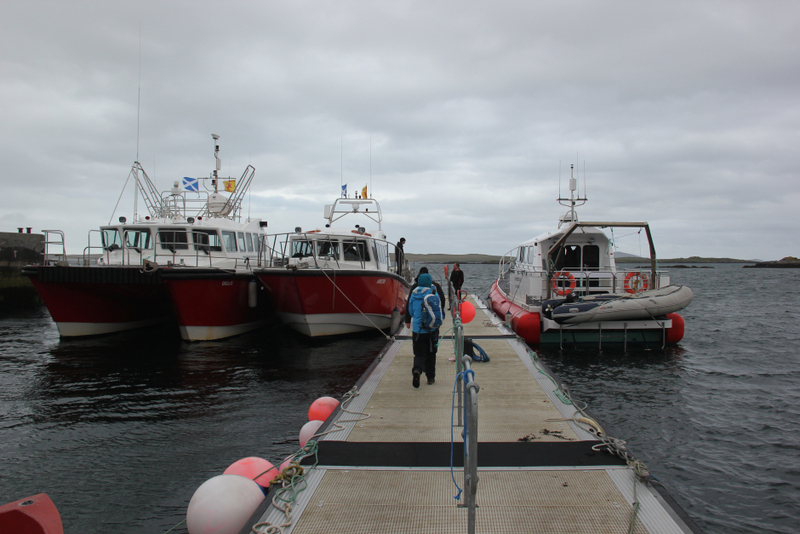 We then took the Calmac ferry from Ullapool to Stornoway. 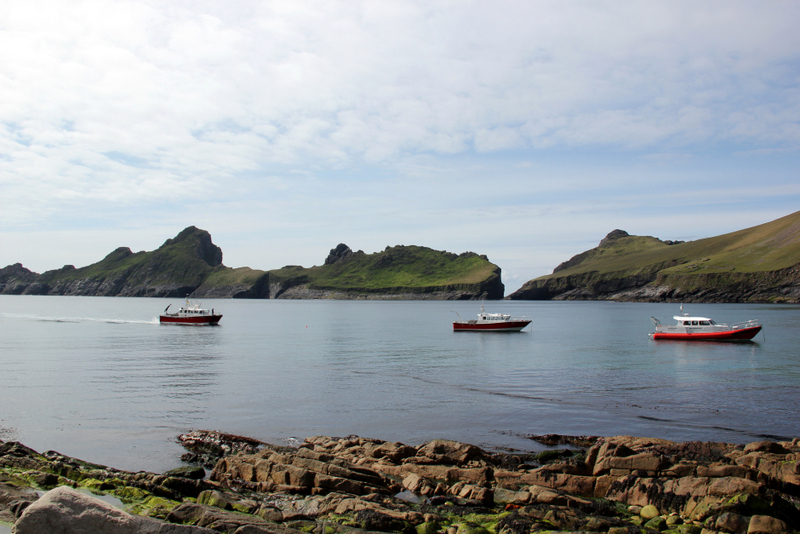 From Stornoway, we drove to Leverburgh in South Harris and from Leverburgh we took a boat out to St. Kilda. There are several companies which run day trips to St. Kilda. I would highly recommend using the company Sea Harris. 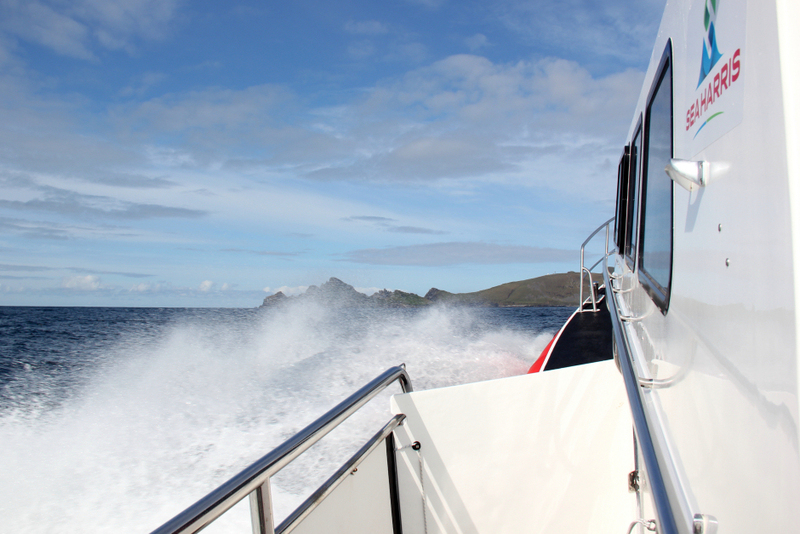 Sea Harris offer the fastest and most comfortable transport to St. Kilda at a very reasonable price. The Enchanted Isle vessel, used by Sea Harris, is brand new. On booking with Sea Harris, you book a two-day window for a single day trip. We booked Friday and Saturday. 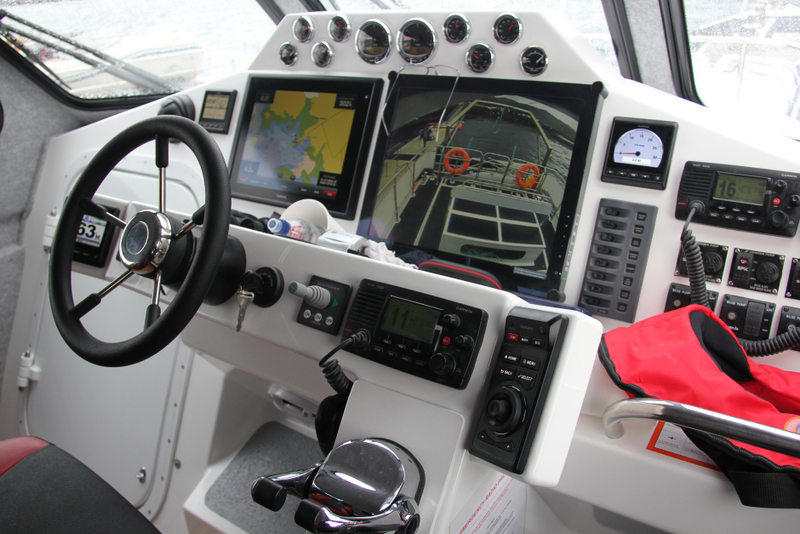 On Thurday morning, we were advised that the boat would not be running on Friday due to the inclement weather. On Friday morning, we were advised that the trip was on for Saturday . 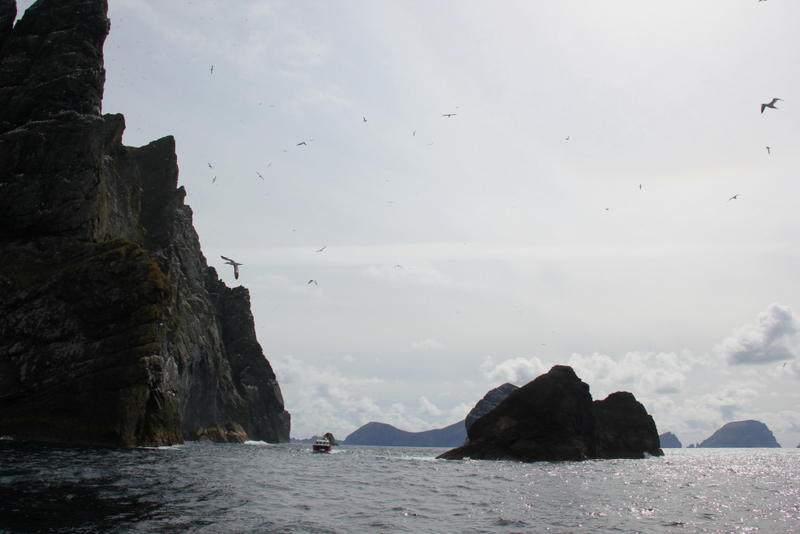 During the month of May, due to very poor weather, the boats to St. Kilda have only run on 5 out of 31 days. We were therefore really fortunate with our choice of days; even more so given the perfect weather to come; a calm between two storms. On Saturday morning we made our way down to the pier for 07.45 where we were greeted by captain Seumas and first-mate John. I was fortunate to get the seat up front next to Seumas . 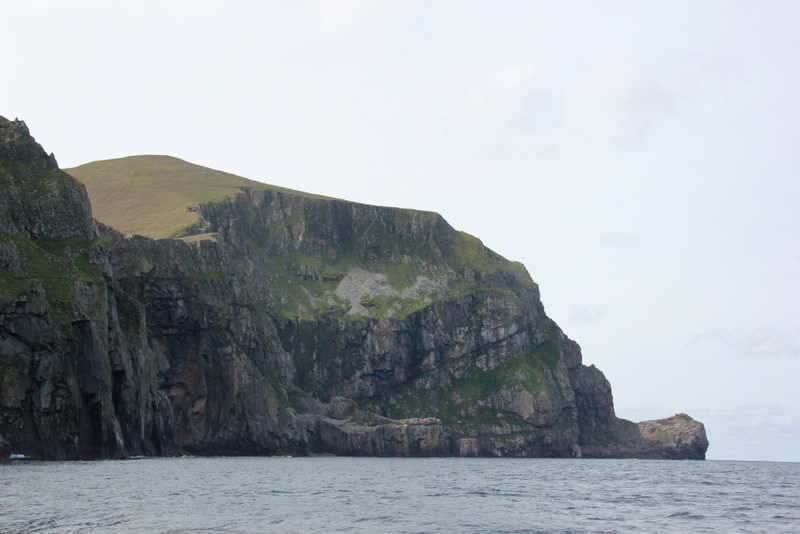 The crossing from Leverburgh to St. Kilda was outstanding. 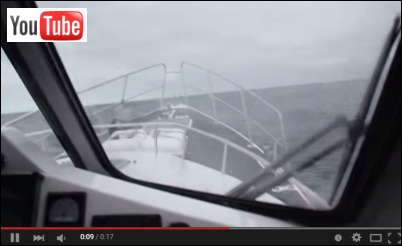 The sea was rough with large swells of at least two metres. 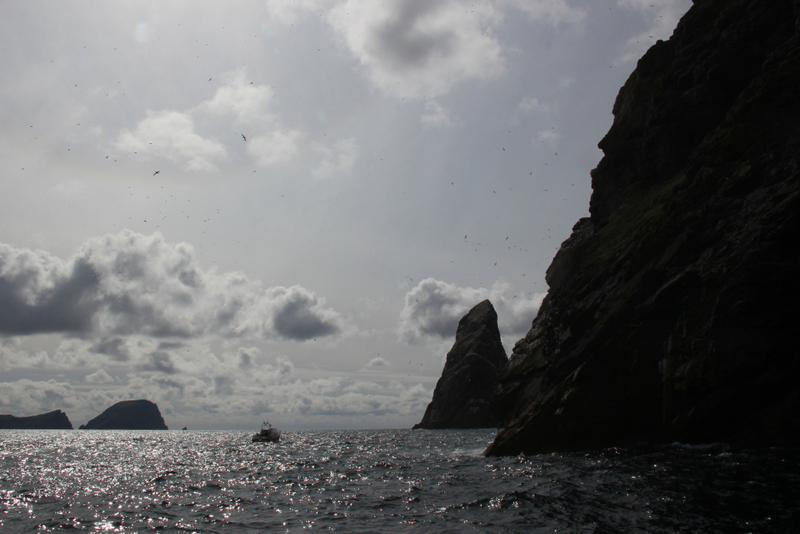 The Enchanted Isle cut its way through the stormy waters and in no time was way out in front of the other St. Kilda boats. 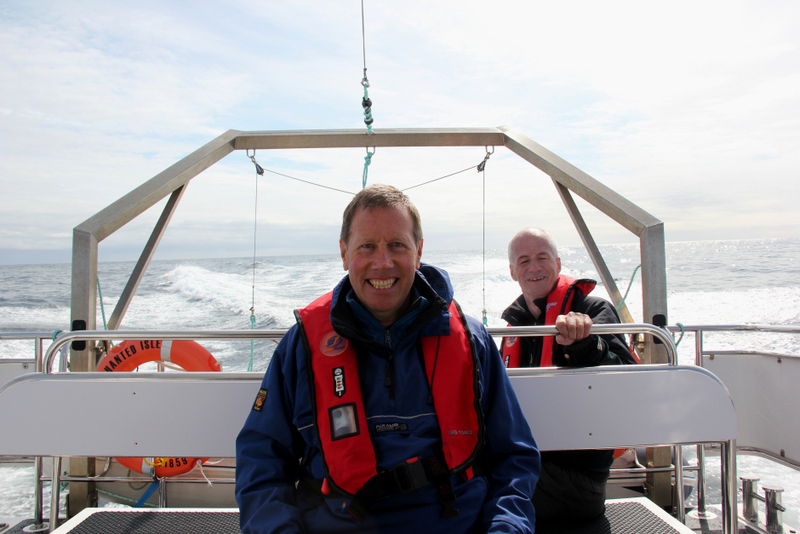 Fortunately no-one was seasick, although one or two on the boat were fairly close. It was nigh on impossible to take photos because of the rough seas. Instead I tried taking a short video clip. 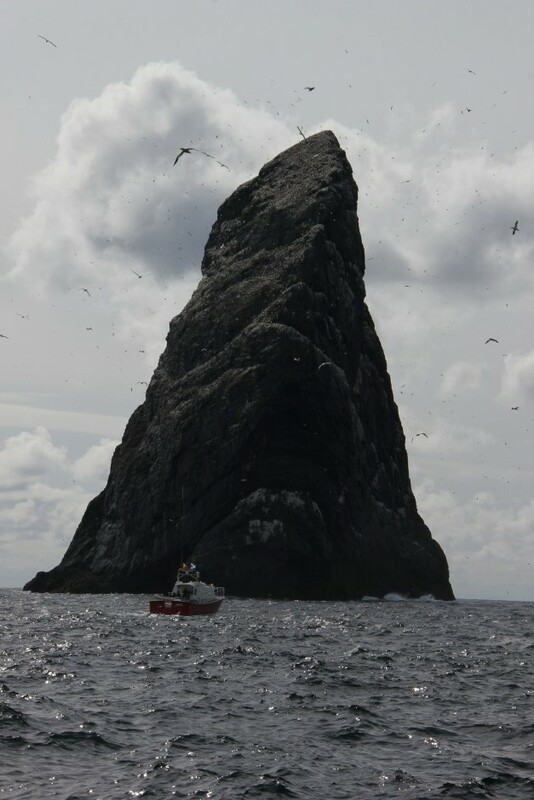 The crossing from Leverburgh to St. Kilda takes approximately 2Hrs 30Mins. 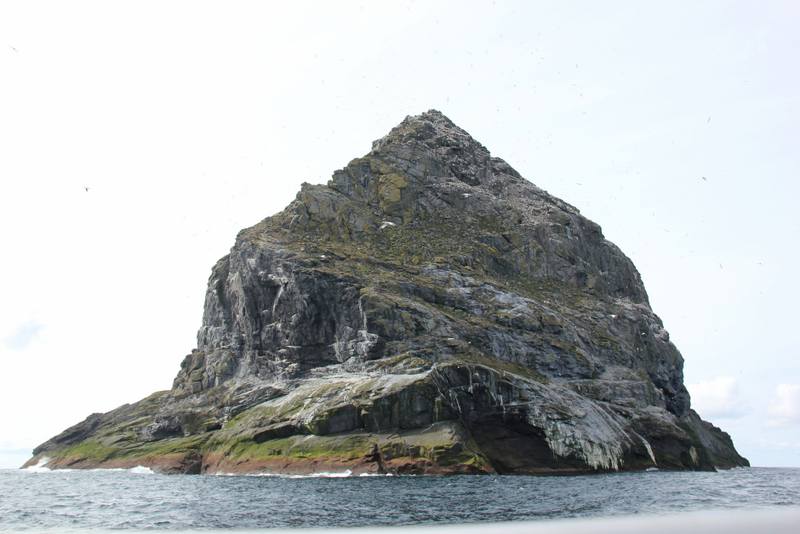 As we approached St. Kilda, we ventured out onto the deck to take some photos. 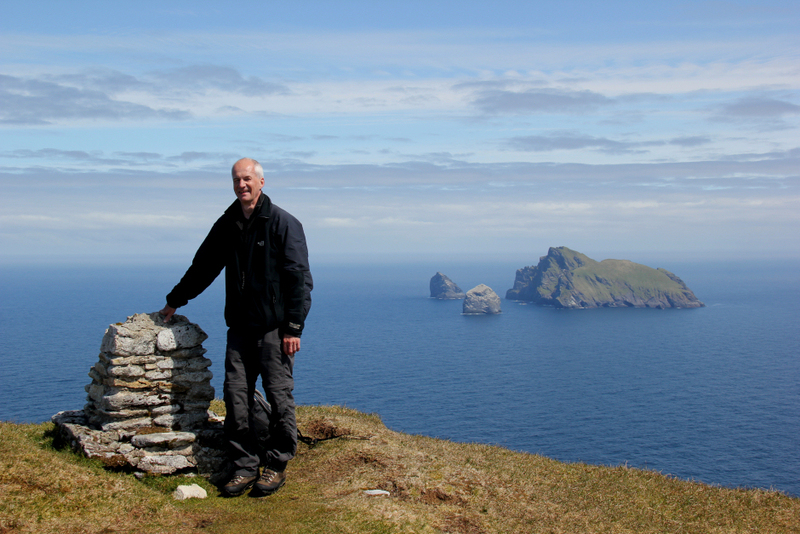 It was great to look across to the stuff of legend: Boreray, Stac an Armin and Stac Lee. Later in the day we would get MUCH closer to these stacs. 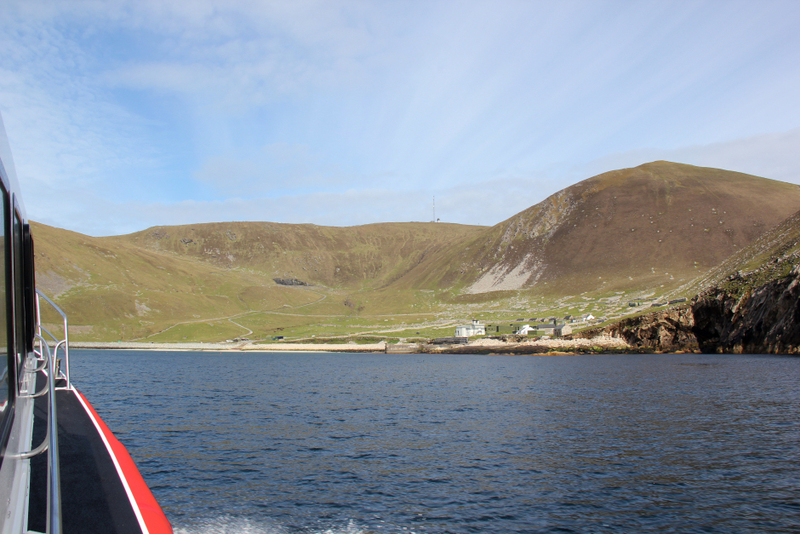 On reaching Loch Hiort, we transferred from the Enchanted Isle into a dinghy to get ashore. 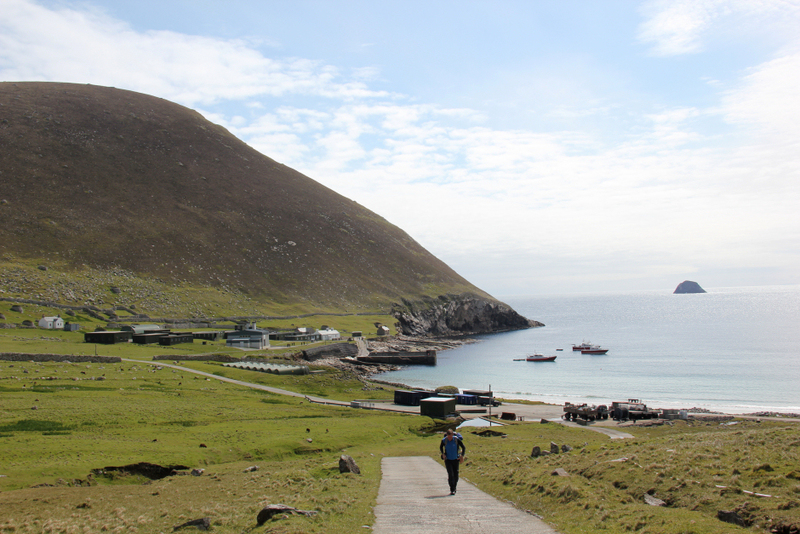 Only dinghys are permitted to land at Hirta as a precautionary measure to prevent any rats from coming ashore. On the pier we were met by the current warden of St. Kilda who provided an overview of the island. 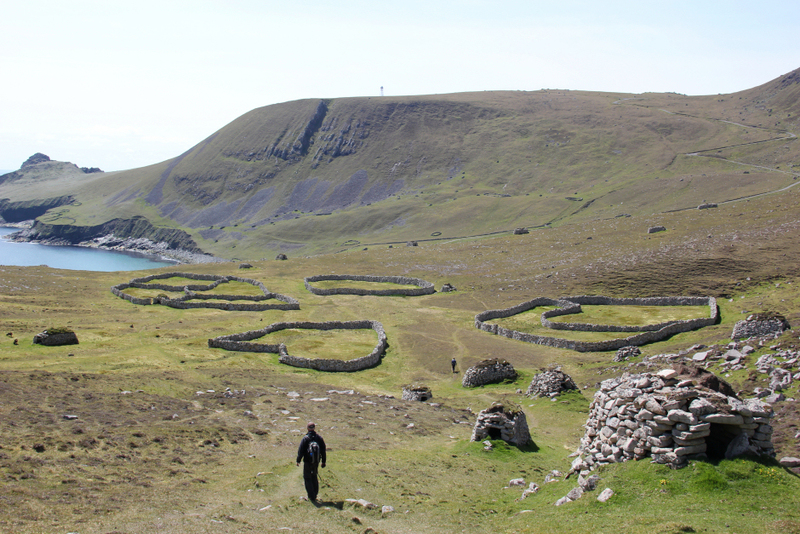 After the overview, we set off on our ascent of Conachair. 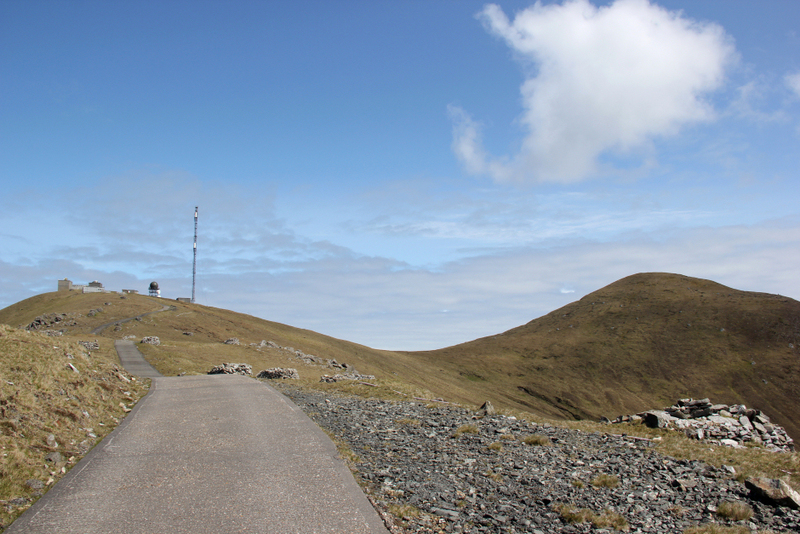 We set off walking along the vehicle track which ascends all the way to the transmitters on Mullach Mor (361m). During the walk, we stopped numerous times to take photos. 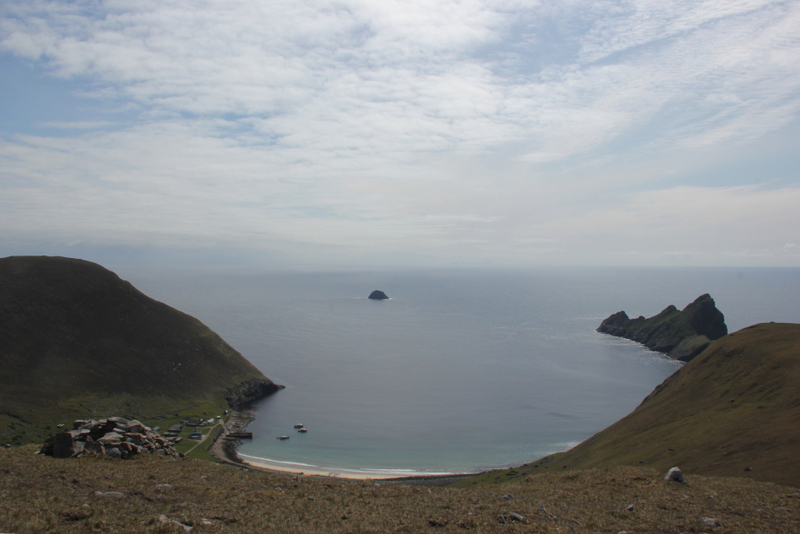 I was amazed to see how close the island of Dun is to the island of Hirta. 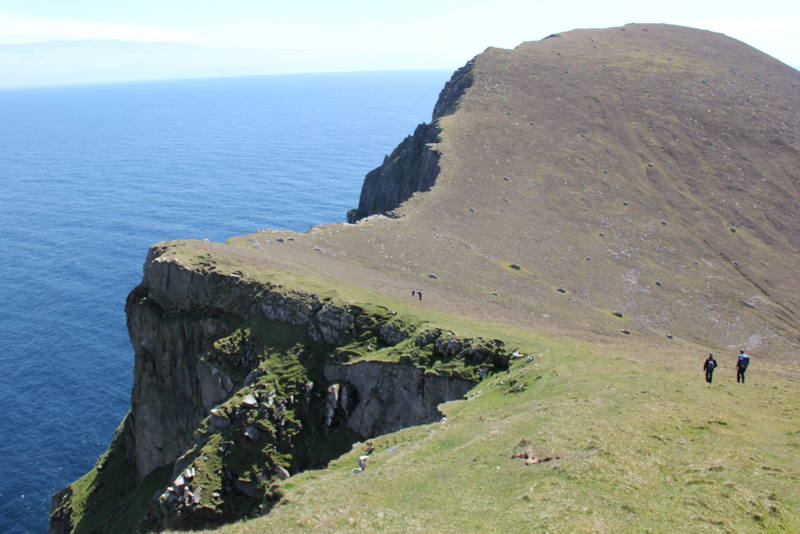 There is however a small cliff at the end of Dun which would make crossing the short gap very difficult. We passed various military buildings including a large eye-sore that is totally out of place on such islands. 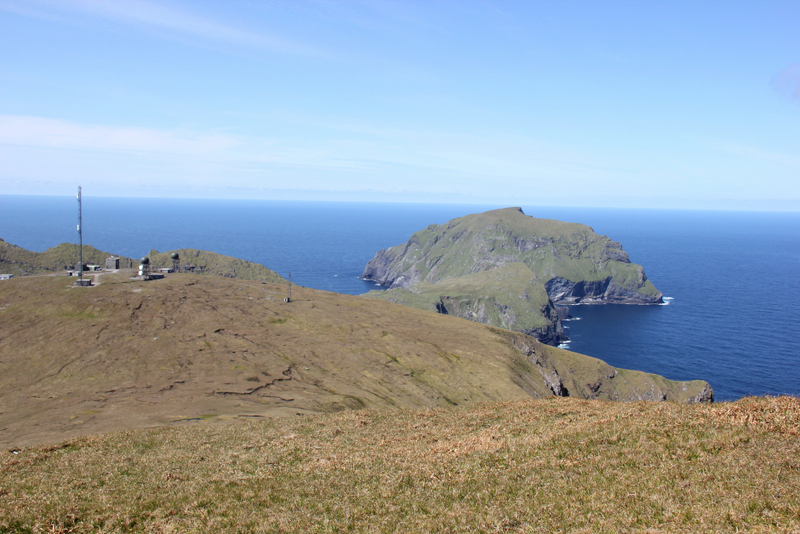 The array of transmitters atop Mullach Mor would also be best removed from this archipelago. 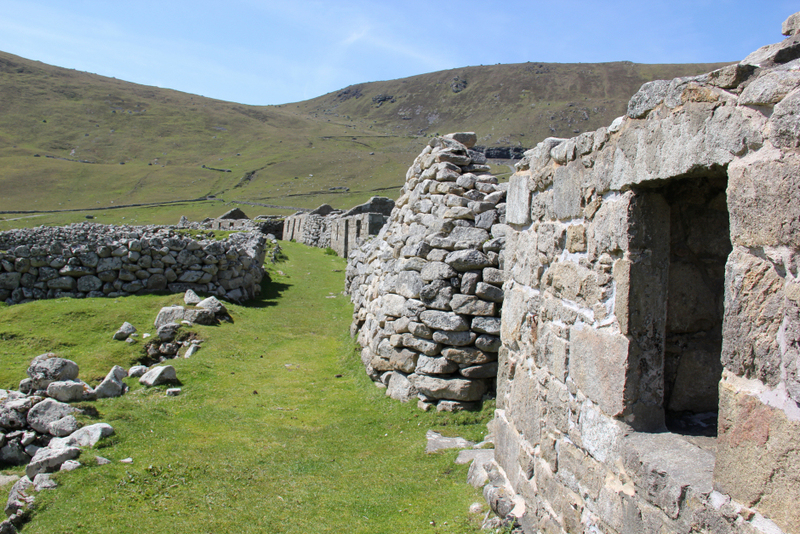 We passed numerous old buildings and countless cleats as we made our way up the track. We gained height fairly quickly getting increasingly good views down to Loch Hiort and across to Dun. 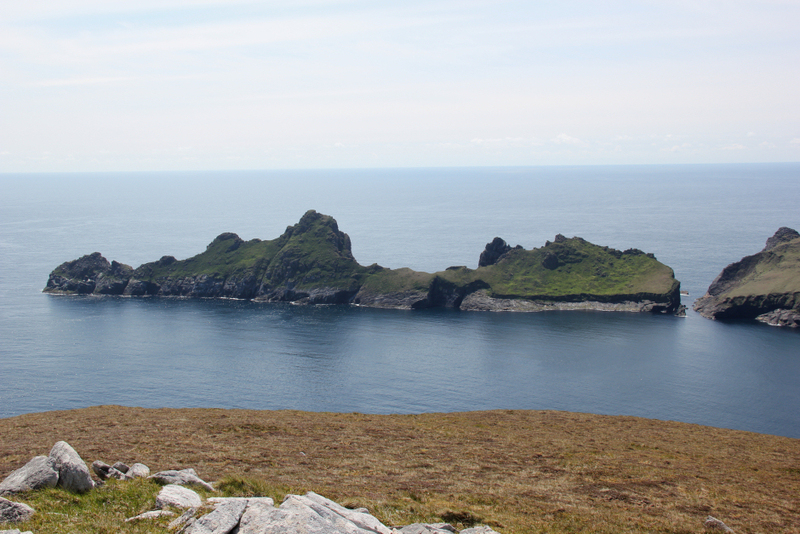 The small island which can be seen in the next photo is called Levenish. 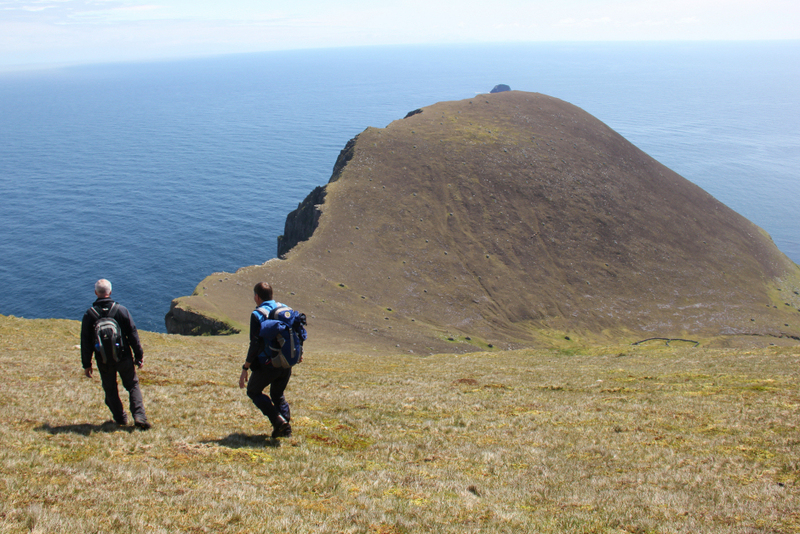 On reaching the ridge, we got our first view of the island of Soay. During the ascent we did leave the track several times to take photos. 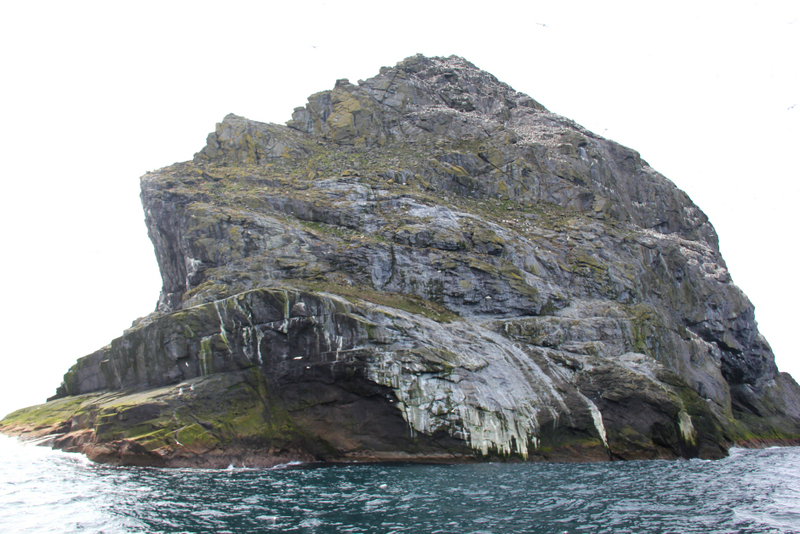 The Marilyn on the island of Soay looked more difficult than I had expected; fairly steep with almost nowhere to land a boat. 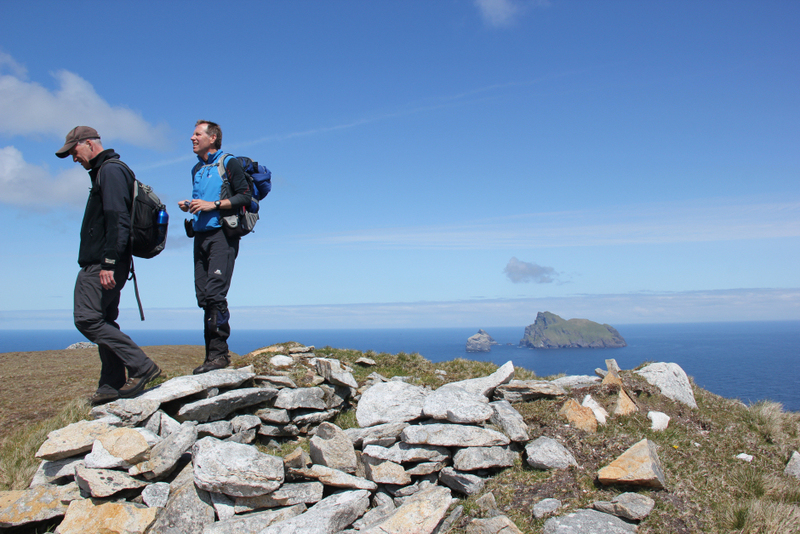 On reaching the summit of Mullach Mor, we had a look at a brick memorial to airmen who were killed in a crash on Hirta. 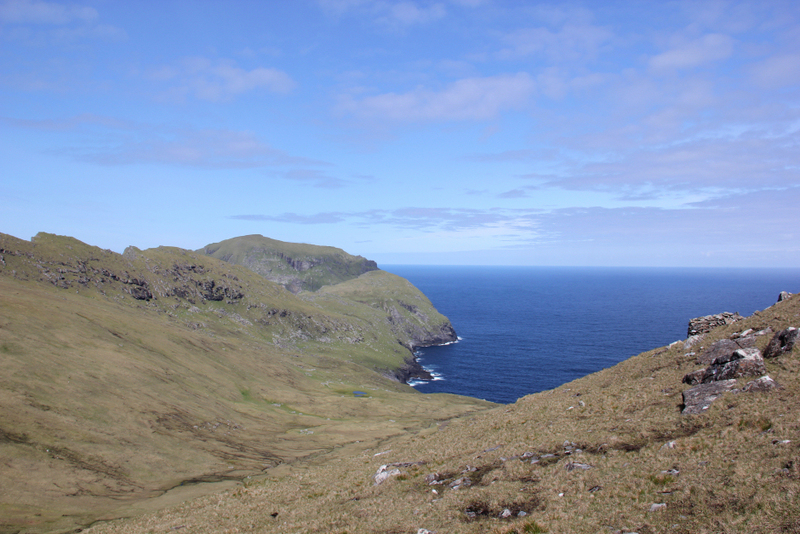 The remains of two crashed aircraft are located on Hirta. 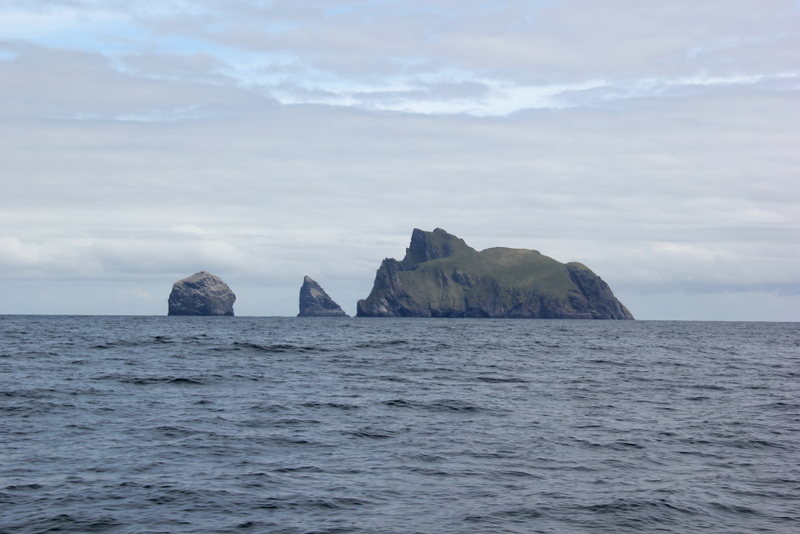 Views improved dramatically as we proceeded beyond Mullach Mor in that Boreray, Stac Lee and Stac an Armin came into view. 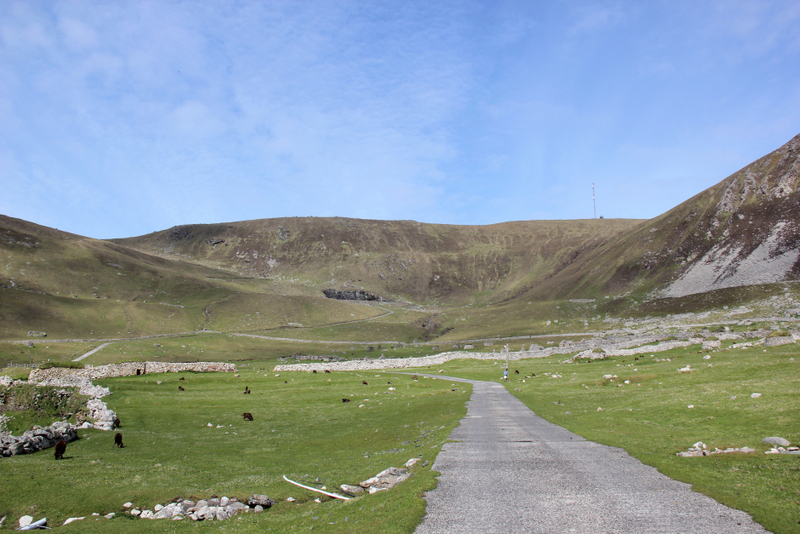 The ascent from Mullach Mor to Conachair is trackless. 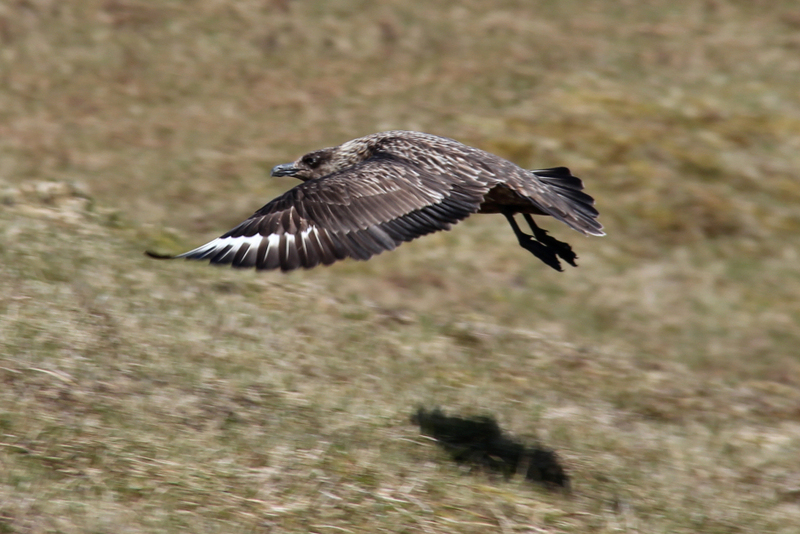 This is the domain of the Bonxie! 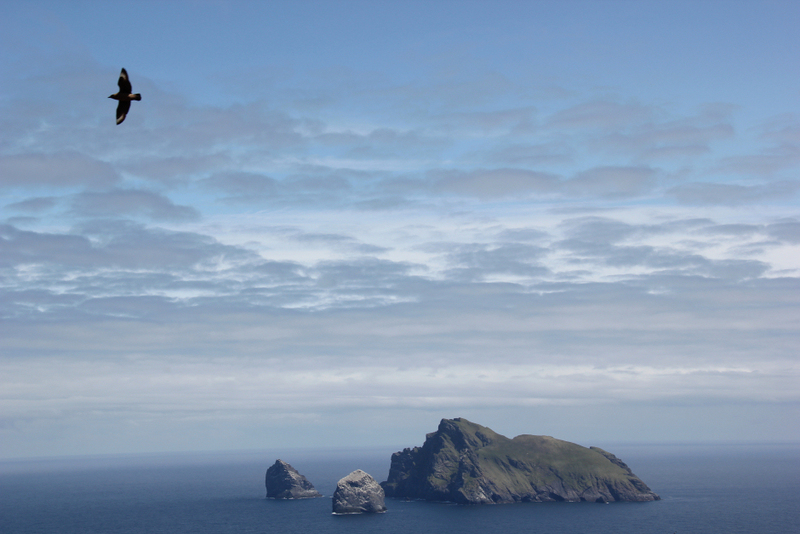 During the final ascent of Conachair, we were attacked by a couple of Bonxies. This however was nothing compared to what we would face in descent! 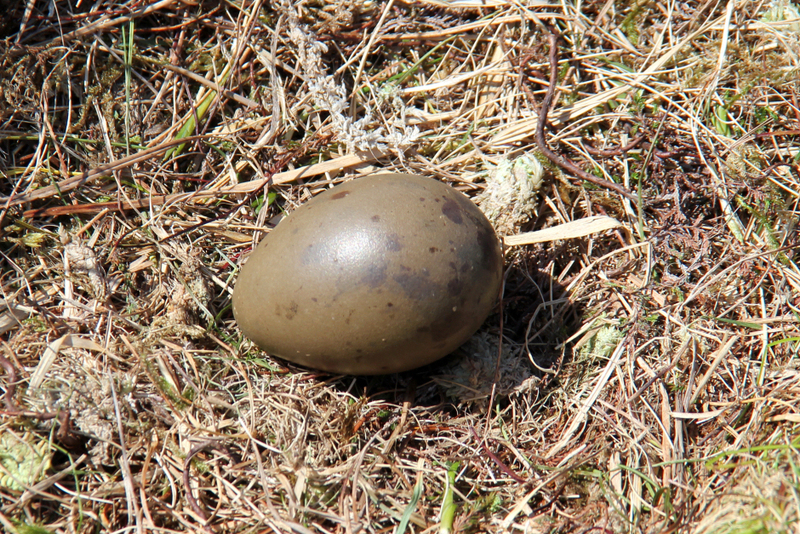 I have encountered Bonxies several times previously, primarily on Orkney and Shetland. This was however a new experience for Alan . 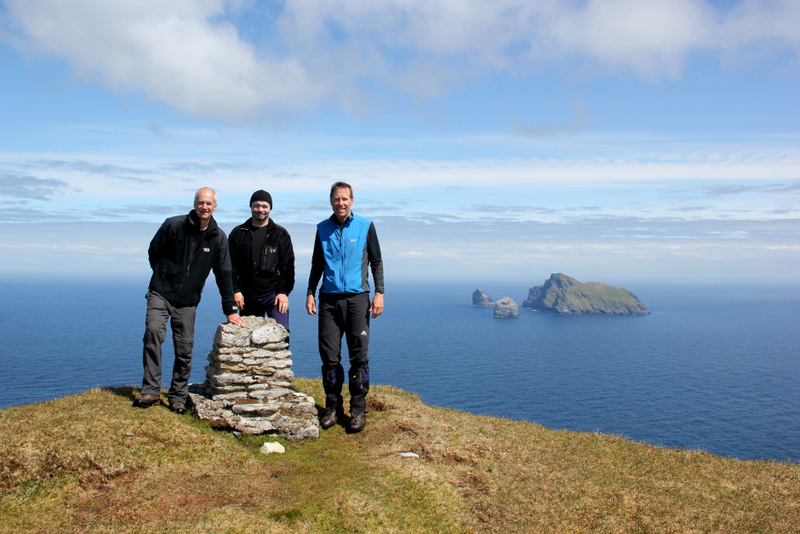 On reaching the summit, Alan visited the summit first and then myself and John visited the summit together. 1000 Marilyns complete . While at the summit we met another walker who had ascended via our descent route. He kindly took a photo of all three of us. 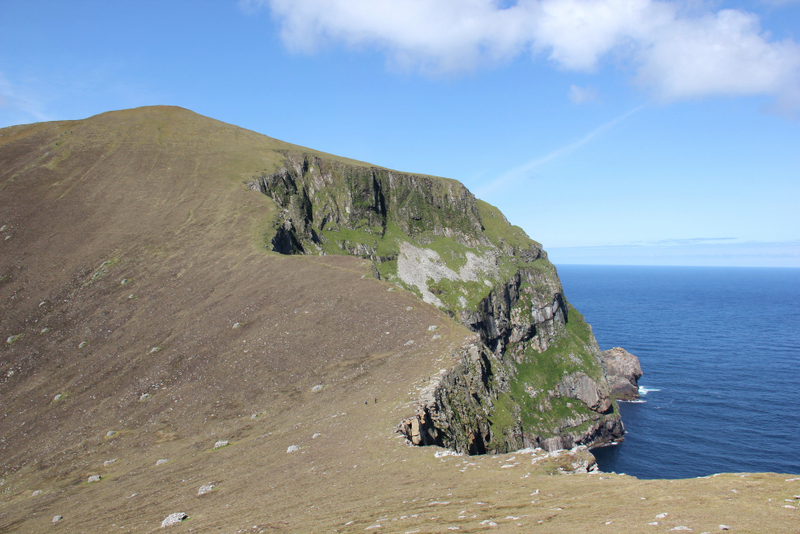 The descent from Conachair towards Oisebhal was steep and covered with Bonxies. John was first to be attacked, then Alan then myself. 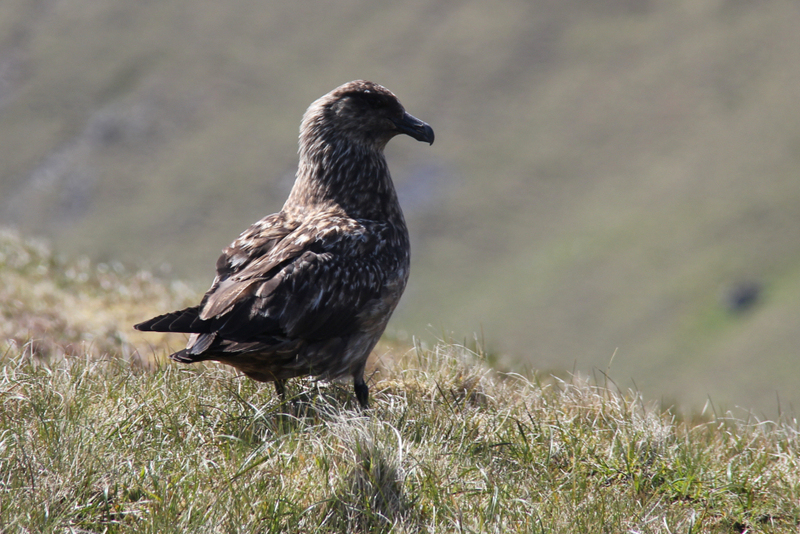 We were initially attacked by a lone Bonxie until its mate came along. Two became three, three became four until we had five Bonxies attacking us at the same time. The whoosh of their wings as they flew past sounded quite loud. Fortunately, we could see the ones coming towards us and could see the shadows of the ones approaching us from behind. 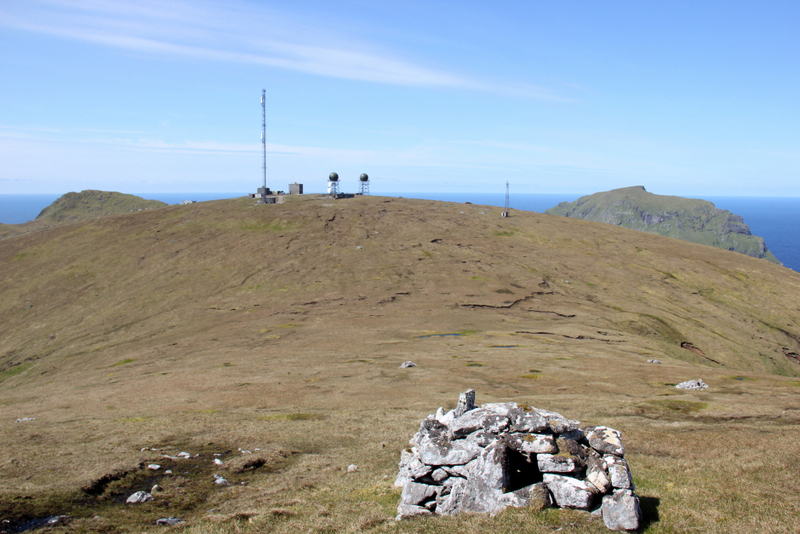 If ascending Conachair at this time of year, take walking poles with you to fend them off. At the end of the day, they are only protecting their eggs. 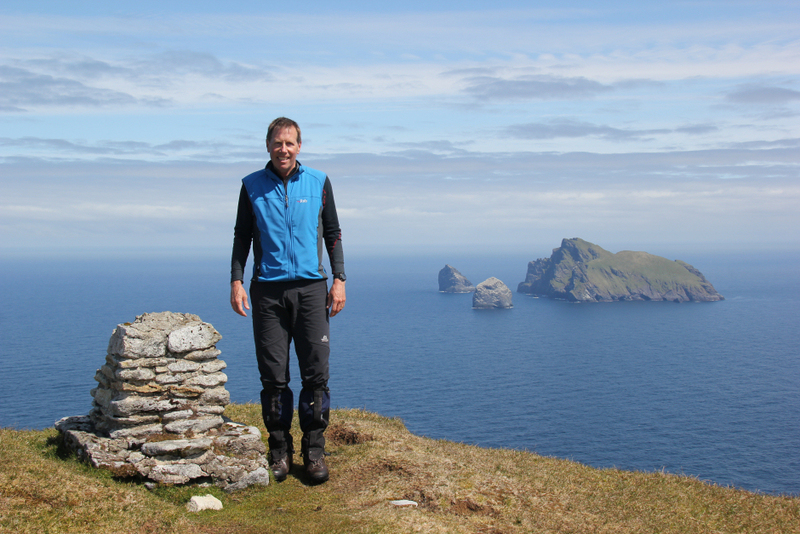 On reaching the col between Conachair and Oisebhal, we stopped for lunch. The cliffs at the col are vertical. 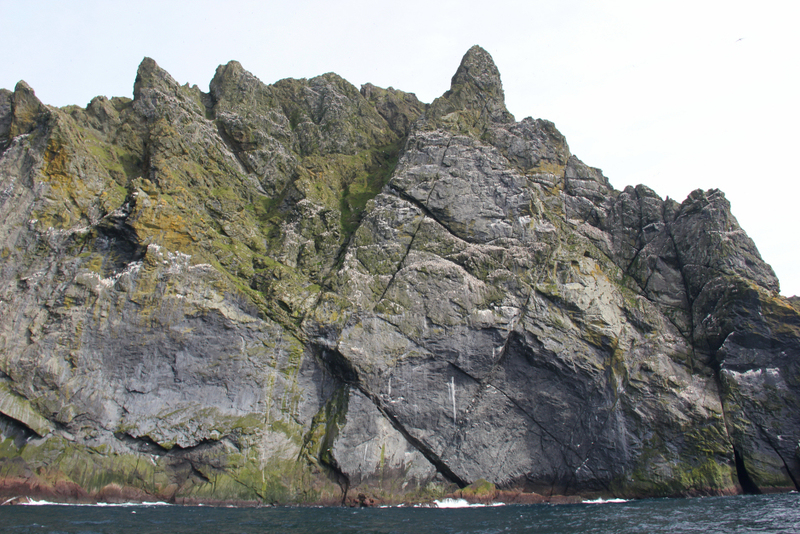 These cliffs are home to numerous fulmar. 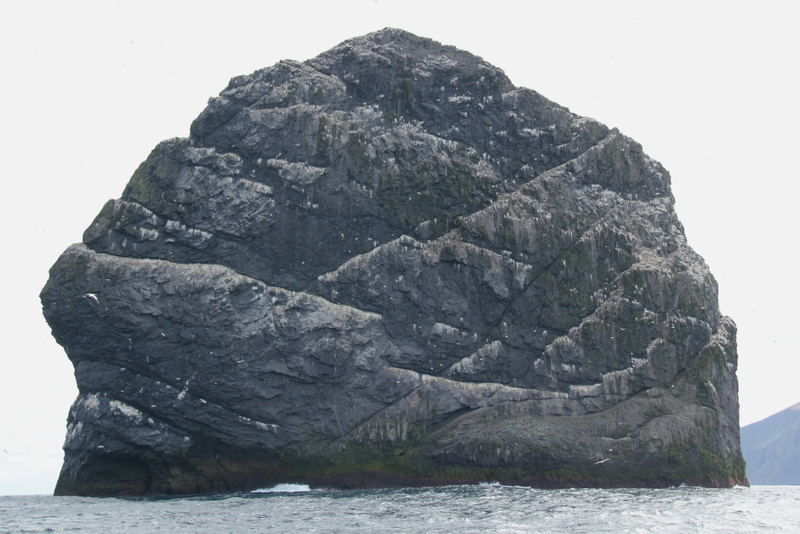 As we had plenty time, we also decided to ascend Oisebhal which is a HuMP (Hundred Metre Prominence hill). 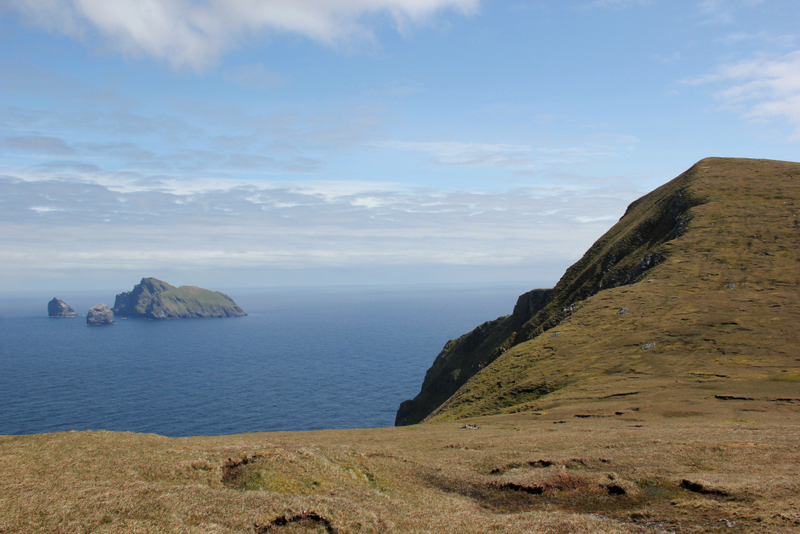 It is worth ascending Oisebhal for its great views across to Dun. During the descent, I was again attacked by Bonxies as I got far too close to their eggs. 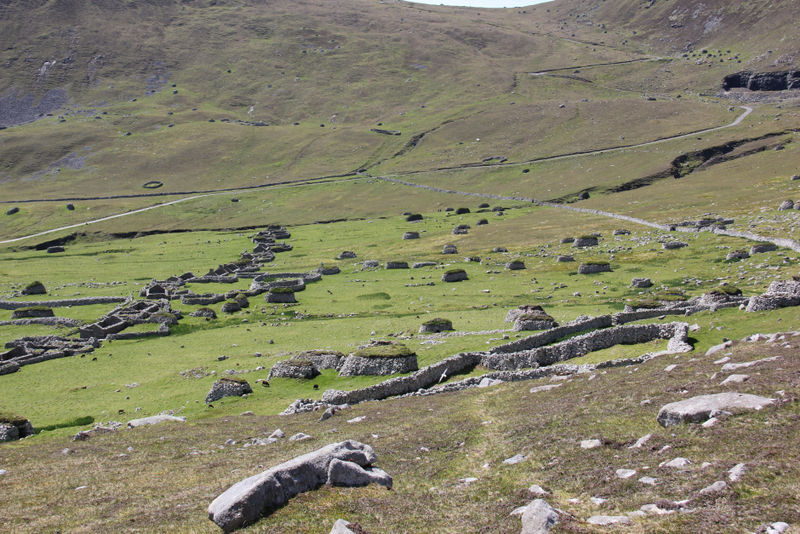 We made our way down to the old village passing lots of sheepfolds and cleats. On reaching the village, we visited the museum and also the old church/school. As I walked along the shore I spotted two birds that I did not recognise. 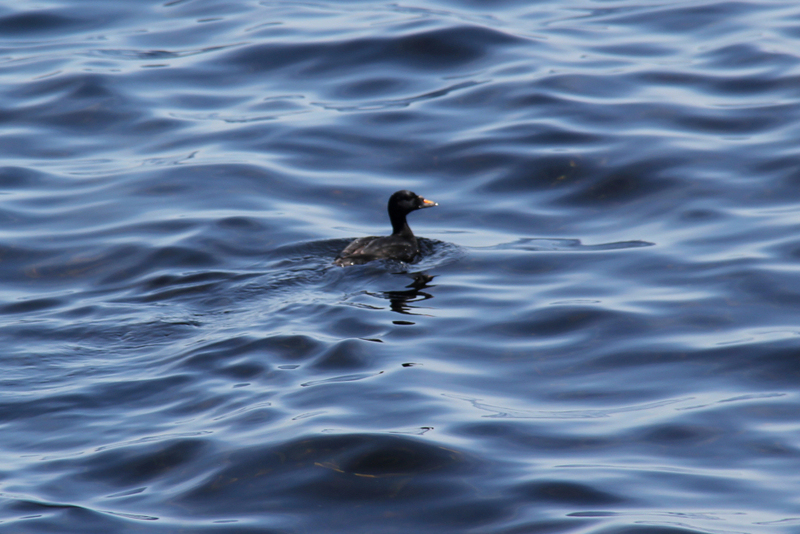 On looking the birds up back home, I found out they are Common Scoter. According to the RSPB site there are only 52 breeding pairs in the UK. 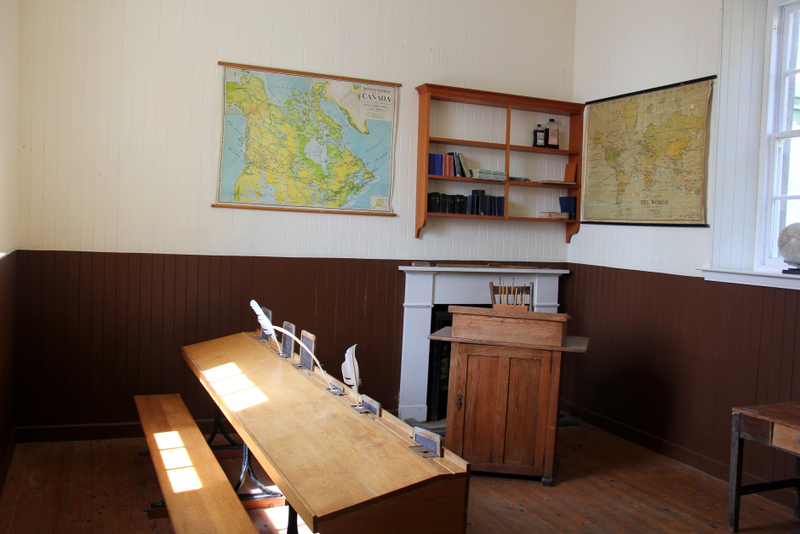 The old school had a number of interesting old photos on the wall. 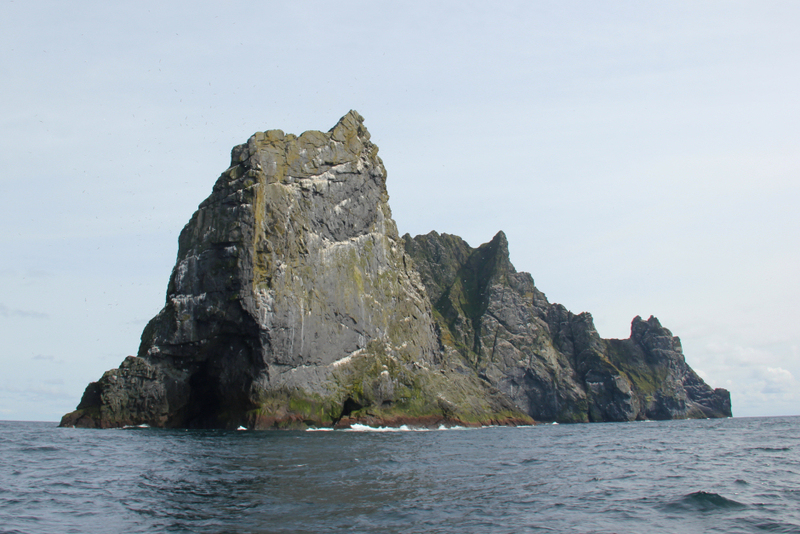 It must have been a tough life living on St. Kilda. 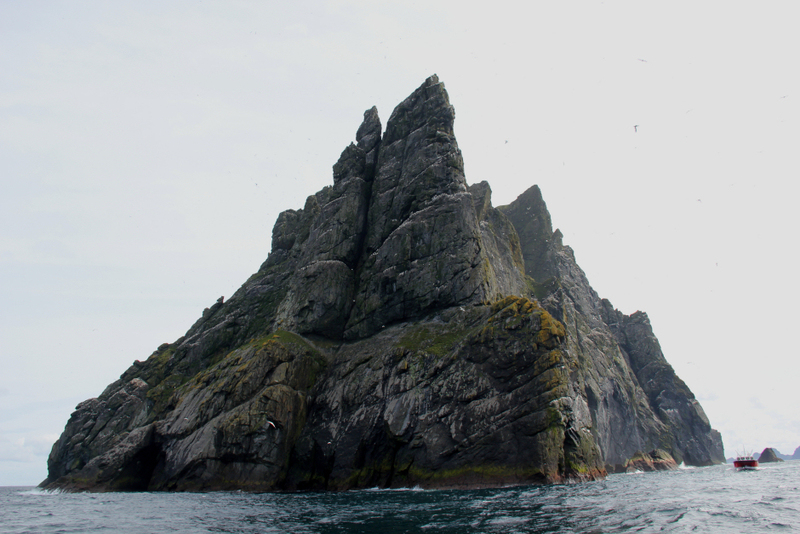 After spending nearly five hours on St. Kilda it was time for us to leave. Thus far the trip was great but by far the best was yet to come. 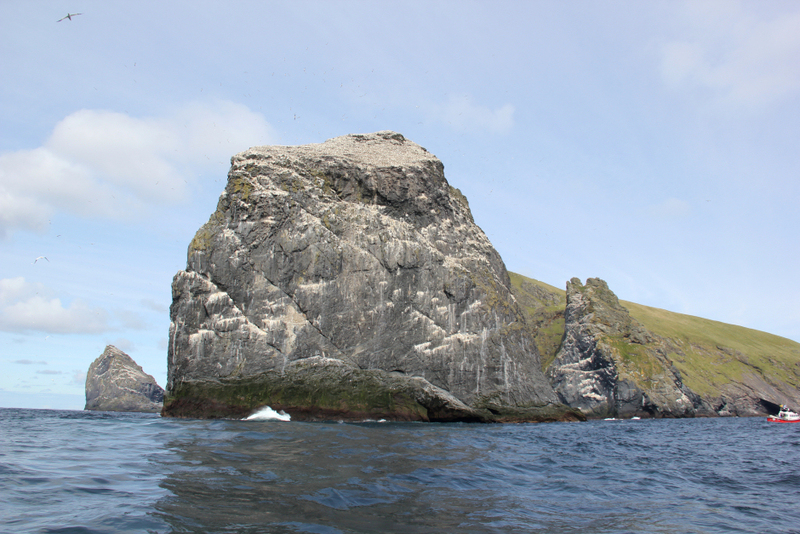 Next we visited Stac Lee, Stac an Armin and Boreray sailing fully around each of them. I took >120 photos of the stacs. I have included a few below. 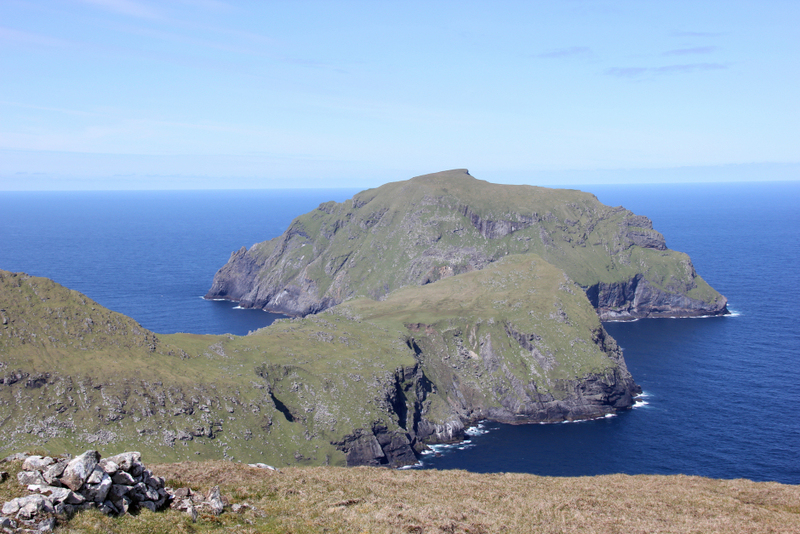 These photos do not in anyway do justice to the spectacular sight that is Stac Lee, Stac an Armin and Boreray. These really have to be seen to be believed! 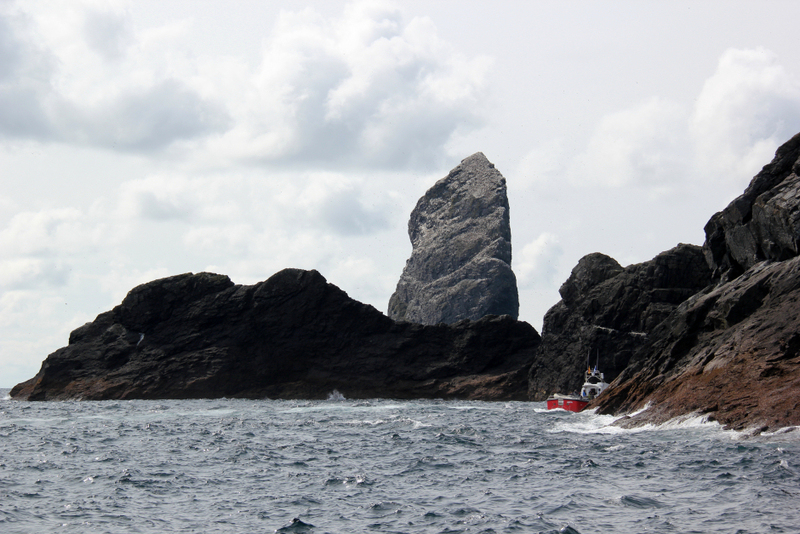 The journey back from the stacs to Leverburgh was fairly tranquil compared with the large swells encountered in the morning. We arrived back in Leverbugh at 19:00. I have been to many wonderful places around the world. I have been to the Alps and the Himalaya but I think St. Kilda trumps them all. 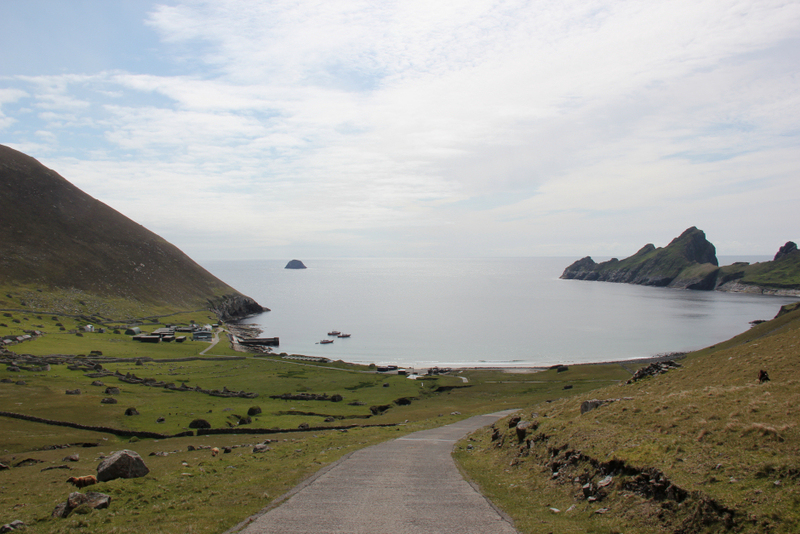 If you have been thinking about visiting St. Kilda, stop thinking about it and do it. You seriously will not regret it! Thank you very much Sea Harris .